When the Iron Lady was on in cinemas here in the UK, it was four years since my mother-in-law was diagnosed (although we had realised things were awry long before this). By this time, she and I had been living under the same roof for almost eighteen months, during which time I had become her primary carer and so spent roughly twelve hours a day in her company. But it wasn’t until I sat in the local Odeon and watched this freshly conjured and newly revealed Maggie onscreen, running from room to room, cranking the volume up on every radio and television she could get her hands on, that I suddenly worked out that our house was haunted. I glanced over and saw that she was staring perplexedly at an empty arm chair. Well, it was and it wasn’t. On the one hand, Mum showed no sign of being distressed by my census of the room, and yet, I was pretty sure she could still see someone else in the empty chair. Once or twice, I felt my husband was noticing the same thing as me – but still I didn’t say anything. Partly, because one of the side effects of Alzheimer’s is that everyone in its vicinity ends up having their threshold for the unusual raised a bit. But, if I’m honest, I already had a pretty strong sense of who the invisible guest was likely to be, and I didn’t want to upset Gordon by asking if he thought his recently deceased father was in our front room watching his beloved Eggheads. Eventually, Gordon confided that he thought this was exactly what was happening. But the trouble with ghosts is that admitting you’ve got the problem is actually a lot easier than solving it. In the end, we decided to stick with our main policy in the face of all manner of Alzheimer’s weirdness. If it’s not worrying Mum, then we won’t worry about it either. Of course, we were wrong about this, but it would take us several months before we would really understand why. In the meantime, there were other changes to Mum’s behaviour – all of which were connected – but which we also failed to read properly until I saw the Iron Lady. The first of these was in the way she would seek me out if I was in another room. Instead of coming to find me and calmly sitting down to join me wherever I happened to be (say, preparing a meal, or hiding in my study, kidding on I wasn’t a full-time carer), Mum began to announce her arrival by calling out, ‘Melanie! Melanie!’ in obvious distress. For awhile, I mistakenly took to mean she was worried I’d gone off somewhere and left her alone in the house. So, I’d jump up and go to her, calling back, ‘It’s okay, Mum, I’m here!’, and we’d end up meeting in the middle in the front hall, or on the stairs. As soon as she saw me, relief would flood her face, and that’s when a strange thing would happen. Instead of waiting for me to get to her, Mum would turn around and start walking away from me, talking over her shoulder the whole time, loudly telling me about how she’d just got a fright, or that she was ‘panicking’, or that she needed to show me something important in another room (only there never was anything to see). Throughout this, I’d be following her in circles trying to get her to calm down, and since she was raising her voice, calling over her shoulder to me, I’d be raising my voice as well. The full significance of this was lost on me until I saw the scene in which Meryl Streep/Margaret Thatcher, goes around her apartment turning the volume up on all the radios in order to drown out her dead husband’s voice. It hit me then that by running around shouting, Mum was effectively conducting a kind of reverse seance – summoning the living instead of the dead -and creating a situation where I would charge around the house after her, loudly reassuring her about how THANK GOODNESS everything was actually just FINE, that there was nothing to worry about. In other words, without even knowing it, by the time I saw the Iron Lady, I’d already been engaging in accidental ghost-busting for a good few months. 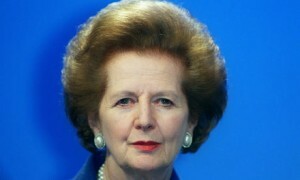 That night, I got home from the cinema and told Gordon that he really needed to see the Iron Lady. But you can be too close to a thing, and Alzheimer’s was simply all too raw for him still, so he couldn’t face it. Not that I blame him one bit. I’ve lost track of how many well-meaning doctors and social workers have recommended that I read Still Alice. It’s been ticking away on my kindle for years now, and can’t even get past the dedication. Then when I inadvertently watched the trailer because Julianne Moore was in it, I tried steeling myself to sit down and watch the film. But I’m still just not there. Yet. In what, before this, had seemed like a completely unrelated trajectory, Mum also suddenly went from being afraid to step out of the front door unless Gordon was with her, to spontaneously opening it herself for a good look around. When I asked her about this, she’d just shrug and say she thought she’d heard someone at the door. Although I know this will probably sound a bit idiotic, but although I spotted this as a definite change in behaviour, it didn’t worry me at all. Mum’s was in her mid 80s by then, and who hasn’t ever thought they heard the door when they haven’t? ‘Yes,’ she said, quite unperturbed by the madness of it all, and still watching him. My eyes must have been popping out of my head as I finally put it all together. The door. Oh my God. She’s been looking for Dad…which is when, the front door slammed. I swear I heard it. Over and over and over again. Or was that me banging my head off the wall? Why, oh why, didn’t we ask her more about why she’d suddenly taken to opening it? The truth is, after so many months where I practically had to drag her if I wanted her to come out front (although she would come into the back garden) I had taken this spontaneous door-checking as a sign that she was finally getting more comfortable in her surroundings, that she was finally starting to feel at home. ’That’s fine,’ she smiled then, and turned to choose a cardigan from the dresser behind her. ‘Do you want me to go down to the front door and check?’ Even now, I’m not too sure why on earth I suggested this, but that little piece of madness was definitely me. I guess it’s that I just didn’t want what I was saying to be true. I’d have loved it if her husband of sixty years could have walked in and taken her back to the safety of the home where she’d last truly been herself. Even now, the strangest part of this conversation was how calm she was. Until then, I’d had no idea as to how far walls between our shared reality and the reality of the inside of her head had crumbled. By this time, we had specialist dementia carers coming in and spending a couple of hours a day with Mum during the week. On that day, the carer who came was a particularly unflappable woman named Joy. When I told her about how weird the conversation had been, but how at least I had now worked out why Mum was checking the front door, Joy suddenly jumped up and went into the front hall. You see, although we had been living with Alzheimer’s for several years by then, and we might have thought we were getting pretty good at spotting risks, the reality is that we were only ever good at doing it in hindsight. We thought that because Gordon’s mother was afraid to go anywhere without us, that there was no danger she’d ever end up as one of these tragic old women who wander off alone. But now we know better. While it may be that some dementia sufferers wander off on their own, I’ll bet you a fiver that most of those who wander off do so because a trusted loved one swings by to get them. It’s just that sometimes these loved ones are what you and I – due to the limits of our realities – might think of as ‘dead’. Obviously, everyone’s situation is different, and what works for one family won’t necessarily be of use to another. But there were a couple of things from our ghostbusting phase which I suspect could translate across to other situations. It seems obvious now, but the way Mum would shout and rush about should have alerted me sooner to the fact that she was trying to get away from something. At the time, we started calling it ‘transitioning’, as though she was trying to get back to us from wherever in her memory she was at that time. But now I think of it more as ‘banishing’. She was shooing away her ghosts. Just coming out and asking Mum if she was seeing her dead husband in the lounge seemed out of the question to us, when really, it shouldn’t have been. She loves us, and knows that we love her. So she trusts us, and it has turned out that there has really never been any topic that is off-limits to ask her about. Still, it often took us too long to bring awkward things up. But the reality is that, even if she had been upset by it, she would have known we meant well. And then she would have forgotten all about. Quite literally. So even if you get it wrong the first time, just remind yourself you are acting in good faith, and take courage from the fact that you’ll probably make less of a hash of it the next time. Behaviours tend not to change spontaneously, but rather as a function of other factors. Perhaps changes in risk levels or rewards, or other external changes, such as environment, the demands of social convention, etc. So, for example, if you think you are living in a suburb of London in the year 2015, you will behave one way. But if you think you are living in Ceylon in the 50s, you are likely to behave in another (we went through a sustained period . However, since people with Alzheimer’s often do and/or say odd things, it is easy to fall into a pattern of chalking it all up to that was strange, and moving on. But recurring strange is a clue that’s probably worth following up. By watching people’s behaviour, and listening to what they are saying, you can usually get a sense of what they think is happening around them – which can be wildly different than what you think is happening (i.e. I think we not in Ceylon at all, and not just because Ceylon no longer even exists). Once you work out what’s behind whatever strangeness you’re dealing with, who knows? There might even be a solution. It’s not always easy viewing, but I found it really useful in helping me to start seeing things from Mum’s perspective. Although I can’t say I was ever a fan of Mrs Thatcher, I know Mum thought she was wonderful, and perhaps this added poignancy somehow. Also, because a great deal of Maggie’s life is a matter of public record, it makes it easier for the filmmaker’s to show us what sliding around in time looks like from the inside. What’s your experience of living with dementia? Have you got any top tips on ghostbusting? If so, I’d love to hear them. Good article, Mel, which I somehow missed until now. Movies and books continue to provide valuable information even to those with first-hand experience. ‘The Iron Lady’ movie was good, but don’t give up on ‘Still Alice’, either the book and the video. One episode from the early stages of Alice’s disease really brought this home to me. The setting was graduate student’s thesis proposal defence at which Alice was present. After the student’s presentation of her proposal, Alice made several technical comments about the research design on issues that both the student and her supervisor admitted they had overlooked and which they promised to address. Other academics in the room nodded their heads about the correctness of Alice’s observations. Then followed some mundane questions from them. The final comments were from Alice – exactly the same ones she had asked 10 minutes earlier. The meeting closed after a moment of embarrassed silence. It was a moving and realistic depiction. Although early-stage Alzheimer’s destroyed Alice’s short-term memory, her knowledge and reasoning remained stronger that that of her academic colleagues. She was ‘Still Alice’. I definitely do mean to get to it. I think it’s the fact that Alice is so young that terrifies me here. Having lived vicariously through normal onset dementia with various loved ones, very time I can’t remember something instantly, I feel myself starting to panic as it is. So to see it happening to someone closer to my own age would be a bit more than I could face at the moment. Another comment not about dementia but dementia-like symptoms. A 91-year-old lady I dearly love went through several life changes recently (moving from one Canadian province to another; falling and breaking her hip; family troubles in which some of her children wanted her placed in a long-term care institution). Her cognition has been variable for the last three years, but reached a low after another fall and hospitalization about a month ago. The hospital staff tested her cognition, with the most incorrect answer on a mental status test being that the current year was 1929. She was also worried that nobody would feed her cat in the basement apartment where she lived – the problem was that she doesn’t have a cat, and never in her life has had a cat. It would have been easy for the hospital staff to classify her as demented and put her in a institution. Thankfully, they didn’t. A staff member was perceptive enough to consider other reasons for her impaired cognition. They noted a recent increase in the number and type of prescribed medication, and considered the possibility of delirium brought about by over-medication. So they took her off all medications except for a necessary thyroid pill. Within three days, her cognition was back to levels not seen since her mid-80s. So with no cat to feed, she happily living independently again. Thanks for this, Mike. A terribly chastening story. Gives you a real, there but for the grace of God feeling! Having sat with my mother-in-law while so many different tests have been applied to her over the years, you really take away that context is everything. So much of what she is saying makes perfect sense…if only you know the major clue that she believes we are in Glasgow, or Sri Lanka, etc. Also, it is astonishing how she still excels at general knowledge quizzes, but cannot work out which pot has tea in it and which one just has hot water. Previous Post Is that a mixer, or a meringue? Next Post TRUE STORY: How eBay became a front line in our marriage.